A couple years back Knit n' Lit hosted this same quilt along. She designed the 72 blocks to finish at 8 inches square, all made from 2 inch half square triangles. If you also plan to use this size, you will need 5 yards of colored fabric, and 5 yards of background fabric. The diagram shows the blocks two-toned but the options are endless! 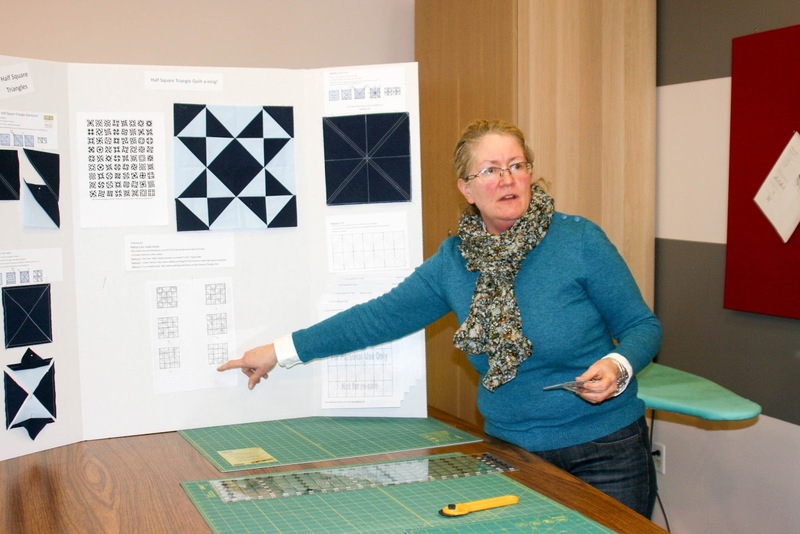 Trish demonstrated different methods in mass producing half square triangles and showing how to use the Block Loc ruler. If you missed the demonstration or forgot, no worries, linked is a video tutorial! 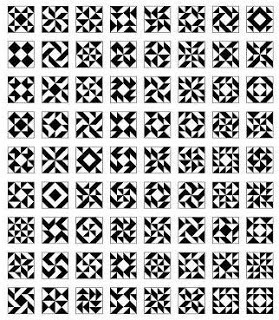 Below is the link to the reference sheet handed out at the meeting with patterns and pictures of each method. Who's with us? If all 72 blocks are too much of a commitment, scale up and make a smaller quilt. We would love to have you quilt along! Hi! I'm not a member of our guild but I love NH if that's enough:) My family has been visiting NH every year for 15 years. I'm actually just starting this quilt as well, so I'm going to follow along with you guys and feel like I'm part of the "in" crowd. I just started my blog three weeks ago, with this pattern as my jumping off point. Awesome to find you guys! What a fantastic surprise to see that folks are enjoying this gift! My husband is still cute and our kids like fabric art now.